Saint Thérèse de Lisieux (January 2, 1873 – September 30, 1897), or more properly Sainte Thérèse de l'Enfant-Jésus et de la Sainte Face ("Saint Thérèse of the Child Jesus and of the Holy Face"), was a Roman Catholic nun who was canonized as a saint, and later recognized as a Doctor of the Church by Pope John Paul II in 1997. She is also known by many as "The Little Flower of Jesus." Born Marie-Françoise-Thérèse Martin, she grew up in a devout family and joined a Carmelite convent at the age of 15. Never a physically strong girl, she manifested a simple but deep mystical faith, rarely complaining despite her sufferings. He autobiography, "The Story of a Soul," is considered a classic of modern Catholic spirituality. Together with her poems, it remains widely read by today. Despite a childlike simplicity and relative lack of formal theological training, she is one of only three women in history to hold the title of Doctor of the Church in Catholic tradition. 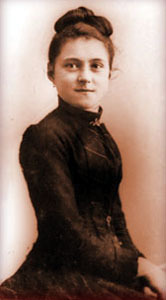 St. Thérèse de Lisieux was born in Alençon, France, the daughter of Louis Martin, a watchmaker, and Zélie-Marie Guérin, a lacemaker. Both her parents were very religious. Louis had attempted to become a monk, but a lack of knowledge of Latin hindered him. Zélie-Marie had tried to become a nun, but was told she did not have the vocation. Instead, she vowed that if she married, she would give all her children to the Church. Louis and Zélie-Marie met in 1858 and married only three months later. Zélie-Marie had seen him crossing a bridge one day and knew that he would be the father of her children. He was a dreamer, idealistic and introverted, while Zélie-Marie was an extrovert with formidable energy and a strong will that was balanced by her generous and affectionate nature. Zélie-Marie created a lace-making business and employed other women whom she trained in the art. They had nine children, of whom only five daughters—Marie (Louise), (Marie) Pauline, (Marie) Léonie, (Marie) Céline, and (Marie-Françoise) Thérèse—survived to adulthood. Thérèse was their youngest child. Two sons and two daughters died in early childhood. Thérèse became ill after her birth, as did her mother, and her parents sent her to a wet nurse on a farm for over a year. She returned home to a grateful family, whom she recalls, gave her "many gentle caresses and smiles" (Flinders 1993, 194). In a letter to Pauline, who was away at boarding school, the girls' mother wrote that, "She is going to be wonderfully good; the germ of goodness can already be seen." Yet she also wrote, "She is such a little madcap... not nearly so docile as her sister. When she says 'no,' nothing can make her change, and she can be terribly obstinate. You could keep her down in the cellar all day without getting a 'yes' out of her (Gorres 1959, 44-45). The family was very devout. The parents attended the earliest mass each day and took communion four or five times a week. They lived a life detached from the world and deeply devoted to Catholicism. Thérèse's mother died of breast cancer in 1877, when Thérèse was only four. Her father sold his business and moved to Lisieux, in the Calvados region of Normandy. There, he lived secluded with his children. When Thérèse was nine, her sister Pauline, who had acted as a "second mother" to Thérèse, entered the Carmelite order of nuns. Thérèse too felt called to join the Carmelites, but was told she was too young. At 14, she said, "the divine call was becoming so insistent that had it been necessary for me to go through flames to follow Our Lord, I would have cast myself into the flames" (Martin 2006, 178). At 15, after her sister Marie entered the same Carmelite convent, with her father's prayerful support Thérèse renewed her attempts to join the order, but the priest-superior of the monastery would not allow this, again on account of her youth. Her father then took Thérèse on a pilgrimage to Rome. During a general audience with Pope Leo XIII, she threw herself at his feet and asked him to allow her to enter the Carmelite order. The Pope simply said "Well, my child, do what the superiors decide." Shortly thereafter, the Bishop of Bayeux authorized the Carmelite prioress to receive Therese; and in April 1888, aged 15 and three months, she became a nun. Upon her father's death in 1894, her sister Céline, who had been caring for him, entered the same monastery; her cousin, Marie Guérin, entered in 1895. These four sisters and their cousin, although young, became a powerful force of influence in the order. They formed a united, visible presence in the community. The fifth sister, Léonie, after several failed attempts to join the Carmelites, became a nun in the Order of the Visitation. Thérèse took the veil in 1889 and her vows in 1890. In the convent, Thérèse found genuine freedom and joy. In the enclosure of the Carmelites she felt free to develop her spirituality and her relationship with God which included her sisters at Lisieux. In 1893, Pauline became prioress and promoted Thérèse to be the assistant to the novice mistress. Although she was younger than most of the novices, she took on the job with dedication and confidence and was a firm taskmaster, continuing to serve unofficially even under a different prioress. Thérèse's spiritual autobiography, L'histoire d'une âme ("The Story of a Soul"), was begun from a suggestion of her sister Marie of the Sacred Heart, and upon the orders of her sister Pauline, known as Mother Agnes of Jesus, when Pauline was prioress at Lisieux. Thérèse began the work in 1895 as a memoir of her childhood. After Pauline (Mother Agnes) gave the formal order to complete the work, it was finished a year later. However, when Pauline finally read it, she was disappointed, as she had hoped for Thérèse to share her testimony of her calling. The third part of the manuscript was due to Pauline's convincing Mother Marie to ask for Thérèse's testimony, to be used as an obituary. In this section Thérèse speaks with a different, more serious voice. The noble-born prioress, Mother Marie, had caused much dissent, and her leadership had created confusion and dissension in the abbey. Thérèse offered earnest instructions on what many felt the prioress needed to re-learn: "true charity, patience with the weaknesses of others, selfless kindness, consideration, sympathy, lenient judgment, true penance, self-control and the high art of guiding souls...chapters that hold up a mirror to the older woman" (Gorres 1959, 220). In part three is also found the deep mystical thinking that became so popular after Thérèse's death. L'histoire d'une âme was published posthumously, and was heavily edited by Pauline when Mother Marie de Gonzague ordered Pauline to alter the first two sections of the manuscript to make them appear as if they were addressed to Mother Marie, as well. The book became a religious best-seller on account of its appealing, simple style and Therese's trust in God despite her incredible sufferings. (When) I take up the Holy Scriptures... all seems luminous, a single word opens up infinite horizons to my soul, perfection seems easy; I see that it is enough to realize one's nothingness, and give oneself wholly, like a child, into the arms of the good God... I rejoice to be little because 'only children, and those who are like them, will be admitted to the heavenly banquet'. Passages like this have also left Thérèse open to the charge that hers is an overly sentimental and even childish spirituality. Her proponents counter that she sought to develop an approach to the spiritual life that was understandable and imitable by all who chose to do so, regardless of their level of sophistication or education. For me, prayer is a surge of the heart; it is a simple look turned toward Heaven, it is a cry of recognition and of love, embracing both trial and joy; in a word, something noble, supernatural, which enlarges my soul and unites it to God...I just tell our Lord all that I want and he understands. To her novice, Marie of the Trinity, she explained: "People must not think that our 'little way' is a restful one, full of sweetness and consolation. It's quite the opposite. To offer oneself as a victim to love is to offer oneself to suffering, because love lives only on sacrifice; so, if one is completely dedicated to loving, one must expect to be sacrificed unreservedly" (O'Mahony 1989, 236). Like Hildegard of Bingen, an earlier female mystic, Thérèse wrote plays and poems for her convent. Her poems expressed a strong sentimental devotion to Catholicism, revealing her deep gratitude in her chosen life of faith. Many of her poems ended with the declaration "I live of Love! "—reflecting the rapture she experienced in her love of Christ. Mother, it is the way of spiritual childhood, it's the way of confidence and total abandon. I want to teach them the little means that have so perfectly succeeded with me, to tell them there is only one thing to do here on earth: to cast at Jesus the flowers of little sacrifices, to take Him by caresses; this is the way I've taken Him, and it's for this that I shall be so well received (Martin 1977, 275). She died on September 30, 1897, at age 24. On her death-bed, she is reported to have reflected upon the intense suffering she experienced in the last two months of her life as her lungs deteriorated, "I am...I am reduced...no, I would never have believed one could suffer so much." (Martin 1977, 230). And then she said, "I have reached the point of not being able to suffer any more, because all suffering is sweet to me." Her last conversations during this time became another part of her autobiography. Her last words were, "Oh, I love him...My God, I love you" (Flinders 1993, 212). St. Thérèse de Lisieux's writings became popular worldwide as they showed a deep and simple joyous union with God that all believers could reach regardless of their station in life. Her "Little Way" opened a new understanding for the simple life of faith beyond all pain and suffering. Pope Pius X signed the decree for the opening of her process of canonization on June 10, 1914. Pope Benedict XV, in order to hasten the process, dispensed with the usual 50-year delay required between death and beatification. Thérèse was beatified in April 1923 and canonized on May 17, 1925 by Pope Pius XI, only 28 years after her death. 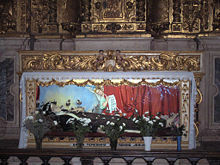 Her feast day was celebrated on October 3 until the Church's calendar revision of 1970, when it was moved to October 1. On October 19, 1997, Pope John Paul II declared Thérèse to be one of the 33 Doctors of the Church, one of only three women so named, the others being Teresa of Avila (Saint Teresa of Jesus) and Catherine of Siena. Saint Thérèse was the only saint to be given recognition as a Doctor of the Church during John Paul II's pontificate. Thérèse of Lisieux is the patron saint of AIDS sufferers, aviators, florists, illness, and missions. She is also considered by Catholics to be the patron saint of Russia, although the Russian Orthodox Church officially recognizes neither her canonization nor her patronage. In 1927, Pope Pius XI named St. Thérèse a patron of the missions. In 1944 Pope Pius XII named her co-patroness of France with St. Joan of Arc. 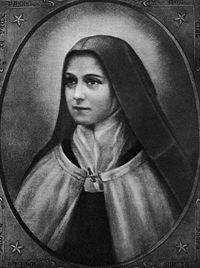 Together with St. Francis of Assisi, Thérèse of Lisieux is perhaps the most popular Catholic saint since Apostolic times. Despite having relatively little learning, as a Doctor of the Church, she is the subject of much theological comment and study and, as an appealing young girl whose message has touched the life of millions, she remains the focus of much popular devotion. A number of Basilicas have been built in her honor. 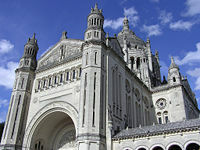 One of the most impressive is located in Lisieux, itself, consecrated on July 11,1954. The remarkable Basilica of the National Shrine of the Little Flower, located in San Antonio, Texas, is dedicated to her and bears her nickname, "The Little Flower" of Jesus. Perhaps the most treasured work of art at the basilica is a painting of St. Thérèse created by her own natural sister, Céline (Sister Geneviève of the Holy Face). 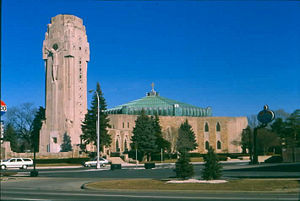 The National Shrine of the Little Flower Catholic Church, in Royal Oak, Michigan, was built in 1925. The church—originally located in a largely Protestant area—was burned down by the Klu Klux Klan in 1936. Rebuilt out of copper and stone, a dramatic stone tower displays a cross bearing a figure of Jesus, 28 feet (8.5 m) high. On the surrounding wall is a carved portrait of St. Thérèse. The Church has been declared a national Shrine, a distinction given to only a few churches in the United States. In 1925, the Carmelite Sisters of the Most Sacred Heart  founded Saint Theresa Catholic School in Coral Gables, Florida. In 1939, Cardinal Dougherty built a high school in Philadelphia, Pennsylvania, Little Flower Catholic High School for Girls. In 2000 the Saint Therese of Lisieux primary school was opened in the Ingleby Barwick parish of the same name in the diocese of Middlesbrough, England. The National Shrine of St. Thérèse, of Darien, Illinois, is home to the most wonderful collection of relics, personal effects and memorabilia of Thérèse outside of France. Visitors are fascinated by viewing actual drawings by the young Thérèse, her toys, her prayerbook, and her chair from her cell in the convent at Lisieux. I am a very little soul, who can offer only very little things to the Lord. After my death I will let fall a shower of roses. I feel in me the vocation of the priest. With what love, O Jesus, I would take You in my hands when, at my voice, You would come down from heaven. And with what love would I give You to souls! But alas! while desiring to be a Priest, I admire and envy the humility of St. Francis of Assisi and I feel the vocation of imitating him in refusing the sublime dignity of the Priesthood. Everything is a grace, everything is the direct effect of our Father's love—difficulties, contradictions, humiliations, all the soul's miseries, her burdens, her needs - everything, because through them, she learns humility, realizes her weakness - Everything is a grace because everything is God's gift. Whatever be the character of life or its unexpected events—to the heart that loves, all is well. ↑ Shrine Town of France. www.villes-Sanctuaires.com. Retrieved on September 28, 2007. ↑ Patron Saints Index: Therese of Lisieux.. CatholicForum.com. Retrieved on September 28, 2007. ↑ Carmelite Sisters of LA. www.carmelitegeneralate.homestead. Retrieved September 28, 2007. ↑ National Shrine of St. Therese. www.saint-therese.org. Retrieved September 28, 2007. All links retrieved December 31, 2014. 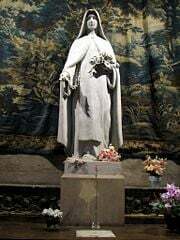 Sanctuary of Lisieux – therese-de-lisieux.cef.fr. Official Film on the life of St. Thérèse of Lisieux – www.theresemovie.com. Poems of St Thérèse of Lisieux – www.ccel.org. Pope John Paul II's porclaims St. Thérèse a Doctor in the Church, 10.19.1997 – www.ewtn.com. Catholic Encyclopedia article – www.newadvent.org. History of "Thérèse of Lisieux"
This page was last modified on 31 December 2014, at 17:07.